The burning question must be answered before it is understood. Why V12 Yoga? Well, Yoga was introduced to me by my best friend, Melissa. She is probably one of the wisest women I know and very observant. She noticed that I was STRESSED out with my corporate job and invited me to a Yoga class for fun with the girls, to relax and gather some meditation time. Well, after that first class, she never returned and I continued my journey of exploration with the seed she planted. My love for the flow slowly grew into a passion and then a lifestyle. I noticed a change in my energy, my mind and in my relationship with myself. I explored different studios, forms of yoga and books. A month later, I decided I wanted to learn to teach and followed my passion to receiving my teacher certification. My life continued on with the chaos of work, travel and just everyday living. I continued to practice yoga, but found my heart parting with the thought of teaching. My passion became a hunger to save my Peace for myself and the joy of being on the mat alone and silent overcame my thoughts to teach. I began to dream of owning my own studio and practicing there. 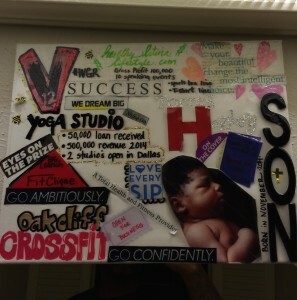 I started to manifest my own studio, the colors, the teachers, the flows, and the location in Dallas. Year after year I would put my Yoga Studio on my vision board and meditation and prayer times. The desire to want became the fire “To Do”. In 2013, the opportunity came and I took advantage of the resources. I had to plant my seed and grow my dream! V12 Yoga was in ink and on its way to becoming a reality! V12 Yoga Means What? Well, a long time friend of mine used to poke fun of my crazy, busy travel schedule and fast pace, so he called me V12. Most people know V12 as the fast engine in luxury cars that drive around in Dallas. You know, your Aston Martins and such. V12 Yoga means some of that, but also something much bigger. It means Power! Power Yoga (Vinyasa Flow) and Inner Power. The highest vibration to help reach the ultimate bliss. All of that energy you build in the power of flow builds beautiful light and power! If you believe your power is within and you are 100% sure in your self, then you emit power outward to others and to yourself. That’s what V12 Yoga represents. No matter how chaotic, stressful, weird, or different your life seems at the moment, you have the power!